Does What's on My Desktop Affect My Computer's Speed? - Ask Leo! Does What’s on My Desktop Affect My Computer’s Speed? A cluttered desktop doesn't slow down your computer in and of itself, but could be a symptom of deeper problems. Leo, I’ve had several people tell me that I have too much stuff on my desktop and that is why my computer is so slow. I think my computer is slow because it’s old. It’s six years old. What should I tell them? If you’re looking at the number of icons, that doesn’t actually affect things in any appreciable way. However, in a backhanded kind of way, it could. I’m going to be honest here and say that I’m just not a fan of having lots of stuff on a desktop. I have maybe two or three icons, max. It’s not about speed for me; it’s about being organized and just hating a cluttered desktop. I can never find what I’m looking for on a desktop that’s full of icons. But you know what? I know lots of people that have incredibly cluttered desktops and it’s not affecting their speed. Let’s be clear: lots of icons on the desktop have no impact on your system speed, period. It has a small impact on how long it takes to redraw the desktop, but that’s very minor. What’s more interesting is what a cluttered desktop often represents. When you install programs, very often those programs will create icons on the desktop. Lots of icons on the desktop could mean that you have lots of software installed on your machine. Often that means a lot of software that you don’t need or use. And it’s very possible that having lots of software installed on your machine, particularly software that includes components that start automatically, could indeed slow your machine down. Some people take a cluttered desktop as a sign that you’re not paying attention to what you install. Think about it: You install an application and a few more icons show up. You install another application, and a few more icons show up. After a while, you end up with a lot of icons on your desktop. The icons themselves aren’t the problem. It’s all that stuff that’s been installed. So these people will then infer that you’re installing stuff that’s slowing down your machine. It’s a common scenario, so it’s not that far-fetched an assumption at all. 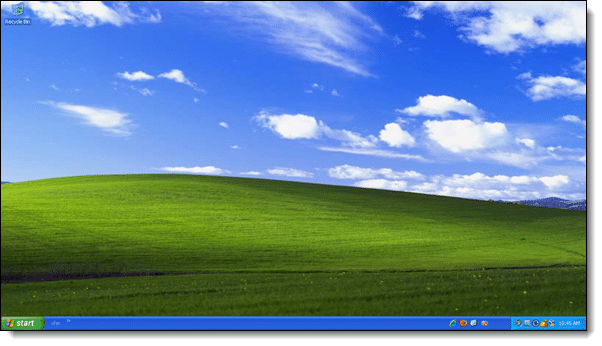 So, if that’s not you; if you’re cautious about the software you install, you’re actually using desktop icons for real things that you recognize, and they’re all there because you want them to be, carry on. We may disagree on whether a desktop should be cluttered or not, but in terms of your performance, it’s just not that big a deal. On the other hand, if there’s a lot of stuff on your desktop that you don’t use and/or recognize, it might very well be time to clean up your desktop. And of course I mean don’t just clean up the icons; clean up what’s installed on your machine. It is indeed possible that what those icons represent could be slowing your machine down. Why Does My Internet Slow to a Crawl When My Desktop Is Turned On? - Many things can cause one computer to hog your bandwidth. But there's a useful Windows 7 utility that may show you where the bandwidth is going. Is It Safe to Store Files on My Desktop? - The desktop is not a place I keep things I use, because it's always obscured. It's also a fragile environment to keep important files because it is prone to mis-swipes of the mouse and more. Does Opening Multiple Tabs Affect My Network Speed? - Without a doubt, having lots of tabs open can impact a computer's speed. Whether or not it slows down the entire network will depend on exactly what all those tabs are doing. Why Did Deleting a Desktop Icon Delete the Program? - The Windows desktop was intended to hold shortcuts to files located elsewhere, but it's not limited to that. « Previous post: Will Macrium Reflect Free keep working in XP? I was told that when Windows boots up – it opens up all the files on your desktop into memory. Not sure if that is true or not – but when I moved a lot of files of the desktop into folders – my bootup and shutdown did run a lot faster (and I had two screens worth of mostly files). What Windows loads at start-up are the icons to those programs, data and folders in order to display them on the desktop. Those shortcuts are approximately 2KB, which is pretty insignificant with RAM being measured in GB nowadays. True and not true. It only opens the files so that it can fetch the icons to display, if the icon is contained in the file. It does NOT load all those files into RAM. Just the icons. Computers don’t slow down, they bog down. Put 1,000 pounds of bricks in your trunk and see how the car performs. What slows down a computer is what you’re set to auto run\start every time you boot up. Use Task Manager of Msconfig to see the list and then disable or uninstall the ones you don’t really need to start every time. A very interesting article about cluttered desktops. But, a question arises, that is, If you don’t use desktop shortcuts, what do you use for quick access to your frequently visited sites? In your trade I would venture to guess you need to visit many sites on a daily basis. You should have seen my previous computer, (Dell Dim. 2400,Win XP-SP3), (Just got a new one, Dell XPS 8700 Win. 8), it had so many shortcuts that most of them were hidden in the ‘Seldom used folder’. I’ve decided NOT to have so many Desktop shortcuts on the new computer, that’s the reason I would like to know what you use. Some people I know say they use the ‘Favorites’ method. But to me that is not a “Shortcut” since it takes additional steps to access your frequently visited/favorite sites. Thanks for your Newsletters, The ones over the Holidays were great. Every time a program saves a shortcut to my desktop, I move it into a seldom used folder on my desktop called links. I’m not even sure why I do it as I never access it. It’s probably just superstitious behavior on my part. I keep all of my frequently used programs pinned to the taskbar, with small icons and I use the desktop as kind of a sticky notes where I place a shortcut to files which I want to remind myself to pay attention to. I use bookmarks, and have my home page set to a private wiki page that has my most commonly used links. I do NOT use my computers desktop for that. Shortcuts that are simply for taking your browser to a page belong in the browser – IMO. Since moving on to Windows 10 I’ve learned to use ‘small’ icons in groups accessed from the start button. They are organized in groups that function best for the way I work. I know of several people that store files of pictures or documents, etc directly onto their desktops, not shortcuts. These files can be large. Is the result the same? That’s a bad idea for different reasons. It doesn’t affect speed, but I have seen people lose documents when the system operates on the desktop. It CAN work, if done properly, but IMO it just adds to the clutter and adds a little bit of risk. I download a program to look up music lyrics & I don’t know how to un-download it. Maybe my ex cause is that I am 63 & don’t know what I am doing!!! Can u help me? If you downloaded it and didn’t install it, you can simply delete it. Of you’ve already installed it, you can go into Programs and Features in the Control Panel and remove it. If you didn’t install it, just delete the file that you downloaded. If you installed it, go into Control Panel in Programs and Features, right click on its entry there and uninstall. If your Windows XP or 7 PC continually runs slow for no apparent reason, and you’re in the mood to do some detective work to find and remove the cause(s), download and install ‘Process Hacker’ (“A free and open-source process viewer with powerful process termination and memory searching/editing capabilities”). Set it up to run instead of Windows’ ‘Task Manager’ (Options > Advanced > ‘Replace Task Manager’). It has many more capabilities. Set it to show the CPU usage of all your running programs and services — heaviest users at the top. To stop the display from updating temporarily, press the ‘Pause/Break’ key at the top-right area of the keyboard. Now, with any items that consistently use more than, say, 10% of your PC’s CPU, *and* that are not programs you want or have *chosen* to run, right-click on each, one at a time, and choose “Suspend” from the pop-up menu (but NOT if you get an error message stating that it’s a required system process). Then judge your PC. If it now runs faster and smoother (as it used to), you’ll know that one, or more, of the items you’ve suspended is causing the slowdown. Take appropriate action to remove the item (assuming it is not a critical operating system process or service) from your system startup, either via ‘msconfig’ or preferably by using a more user-friendly program such as ‘Autoruns’. This is a no-cost, safe way to renew your PC’s original capabilities. Thank you guys I will try to uninstall it tonight. Thank-you for the help. How do I clean/delete everything off my desktop? If you open File Explorer (Windows Explorer on pre-Windows 8 machines), you should be able to drag any files from the desktop into a desired folder. The Article is very much useful. I shall try “Process Hacker” and “Autoruns” when I am free to do so. My question is what profiles can be removed and how before closing a Coreldraw file so it opens fastly next time? #1 It’s not the shortcuts that slow down the computer, it’s files that slow down the computer. #2 “I know lots of people with cluttered desktops and it’s not affecting their speed”, Bologna! How do you really know it’s not slowing down the computer? Microsoft does some fancy footwork to make your Desktop appear at the top of the tree when in fact it’s actually in your profile. I was told by another famous Leo that things on the desktop are converted into “Programs”. This conversion process is the main thing that slows down the computer. If it has to do that for every file on your desktop that’s adding a lot of extra time. Your best bet is to create a folder in Documents called Desktop2 then put a shortcut to this folder on your desktop. I’ve been doing this since Windows 98 and it’s working well for me. Every now and then my desktop gets cluttered but then I’ll drop the files into this shortcut thus moving it to the folder. Then it’s always a click away. I must disagree with this article. I have since over my 20 years in desktop support that having a large number and or large files on the desktop along with most anit-virus software will slow down your system performance. Having to redraw the screen over and over causes your AV software to rescan those files over and over. I have on several occasions shown people if they keep their desktop clear of a large number of files and / or large sized files their system does in fact work better. If you read the article carefully, you’ll see that having a lot of icons, while not affecting the speed in themselves, are often a symptom of something else which might be slowing your system down: the programs those shortcuts represent, but only if they are programs which start along with Windows. The icons themselves are just shortcut files which are not scanned every time the screen refreshes. ( I have Windows 10) I get a “Working on it….” message and it takes a long time to open and once it loads the “little blue circle” just spins and spins. I am unable to open any of the sub folders (circle continues). Icons like Control Panel and a most of the links/files on the desktop open immediately. Q1: Can I move these large folders (gigs) to another location in “C:” or elsewhere to speed things up? with hundreds of photos so it does not slow down things? I’d appreciate any advice. Thanks. Well just because your mind is not capable of handling that mental load does not mean it is the case for everyone else. Please do not imply a cluttered desk is evidence of a cluttered mind…. some of us are capable of keeping track of much more than the average bear…so to speak. Don’t diss us because you can’t keep up!! And don’t diss us who are completely capable of using a different, more organized, and more efficient (for us) system.